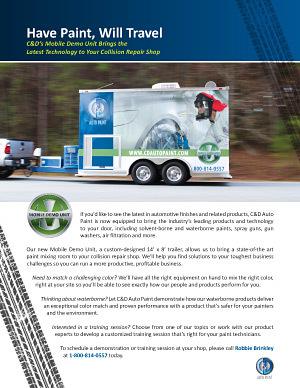 C&D Auto Paint is now equipped to bring the industry’s leading products and technology right to your door, including solvent-borne and waterborne paints, spray guns, gun washers, air filtration and more. Our new Mobile Demo Unit, a custom-designed 14’ x 8’ trailer, features a state-of-the art paint mixing room and more. Simply schedule an onsite demonstration, and we’ll help you find solutions to your toughest business challenges , so you can run a more productive, profitable business. If you’re interested in a training session, choose from one of our topics or work with our product experts to develop a customized training session that’s right for your paint technicians. To schedule a demonstration or training session at your shop, please call or email Robbie Brinkley at 1-800-814-0557 today.